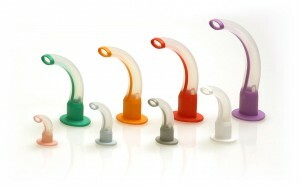 An oropharyngeal airway (also known as an oral airway, OPA or Guedel pattern airway), this airway adjunct is used to maintain a patent (open) airway. The OP prevents the tongue from covering the epiglottis, which could prevent the person from breathing. When a person becomes unconscious, the muscles in their jaw relaxes and allows the tongue to obstruct the airway.